The Twilight Sisterhood: Kristin Stewart kicking off another day at work! New Moon star Kristin Stewart made her way into the production studio this morning for another day of work on her new film, The Runaways. 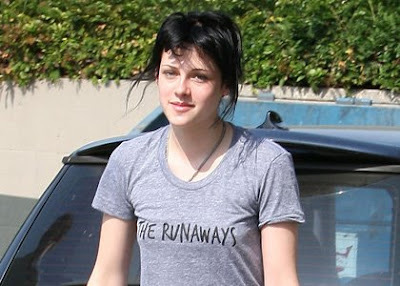 She was totally sporting a grey T-shirt with "The Runaways" Logo across the front. Way to get into your role Kristin! And is this a smile I still see on her face? I'm really beginning to like this side of her. Its actually a cute tee I would buy. URGH why do I have to have the same taste as HER!!! URGH!! I need to channel Ashley Greene! can't wait to see her as joan jett and bella again in new moon!